Register today for your, Complimentary WAVMA Webinar on cuttlefish diagnostics. Join this live interactive webinar on June 1, 2015 at 9:00 AM AEST (Sydney, NSW, Australia, +10 GMT). Click http://tinyurl.com/wavmawebcepdb1012 to see the time in your local time zone. The presentation will introduce participants to the general anatomy and histology of the cuttlefish (Sepia spp.). Using this knowledge, we’ll examine a case study of Vibrio alginolyticus infections in these animals, and explore how the anatomy and physiology help explain the pathogenesis. Interested, but can’t attend? Register anyway and we’ll notify you when the recording is ready. Feel free to forward this announcement to colleagues. 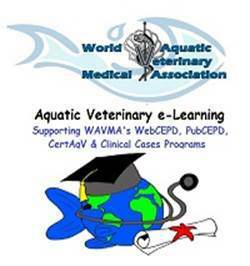 Discover more about the World Aquatic Veterinary Medical Association at www.WAVMA.org. Previous Post Fish joke for Monday-itis: What’s the first day of the working week for fish veterinarians? Next Post Amazing Ornamental Fish and celebrations Brazilian style!